I wanted to share a preview and gameplay notes about the upcoming title in the Panzer Battles series from John Tiller/Wargame Design studio. 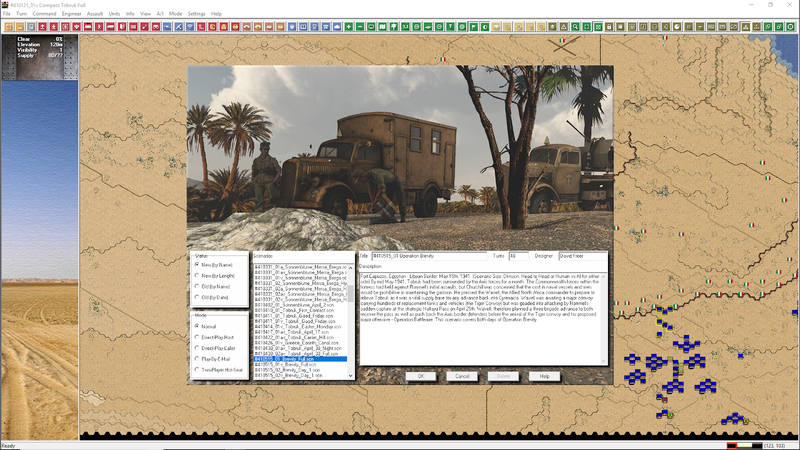 The new addition is a tour of force in early WWII desert armored warfare. Don't let the one year time bracket (just 1941) fool you, the amount and variety of scenarios is great and the tactical situations have something for everybody. From sweeping maneuvers across wide and open terrain, to attacks on prepared positions. They even included scenarios from the invasion of Crete, for those more infantry-oriented. I recorded the above video last night, with gameplay from the Mersa el Brega scenario. My questionable tactical decisions will be lingering the internet for a while ... But my intention is to show how the game plays. That's my story and I'm sticking to it. P/S: for future content, do you prefer videos or the regular blog post with screenshots? Great video! Thanks for posting your initial play and thoughts. Great to see you using the alt move to allow your columns to move along the road. That definitely speeds up play. Importantly, for air and artillery, to use it you normally need a unit that can spot the hex that has not used any movement/action points. In your first couple of attempts to use air, all potential spotting units had already performed an action and that was why air was unable to hit the selected hex. Ideally, you request all air attacks and artillery before moving. An alternative is to stop as soon as you spot a new unit and decide if you want to use available air or artillery, as usually there will be a unit that can see the enemy that has not moved. Air and artillery requires a bit of planning due to the turns only being 30 minutes long and rarely was either on fast turnaround times. Thanks for the clarification on the arty and air spotting. Definitively will have to take this into consideration for this type of extremely mobile warfare. Thanks for the video, show interesting info about scen list. In PzB the use of support (arty+airplanes) is totally different compared with PzC and with many other wargames, you need control a lot what you move and where if you want have arty when you need it after find unexpected enemy presence. Expect as somebody comment in youtube game release be soon. please have a closer up zoom in, we love to see the icons, I know there is no a zoom level but many of us would love to see a even closer view. Check out Order of Battle WW2 to see what I am posting about. My preference is for (regular-ish; weekly or some odd?) blog posts with screenshots. I never seem to have the time to watch videos, but when I do, they've been good. I realize "stay the course" isn't quite the feedback you were looking for. Something curious is that videos of JT titles allways looks me worst as "game sellers" compared with a classic AAR with screenshots and player comentaries, i find them more inmersive... of course this AAR needs more work compared with a video AAR. Xaver, thanks for the feedback and advice. Definitively something I need to watch for this mobile type of warfare. About the AARs, you are right in that they may not look too appealing for younger eyes, but at least they give you an idea of the game flow. AARs are great and I enjoy them a lot too. But my free time has dwindled beyond recognition to afford more of those. Hi HMS, thanks for watching and for your feedback. I will make sure to showcase both views. Hi NW, I know. Time is scarce these days. But I get the idea and I will try my best.